A level of music that surpasses. This is a cd that is lyric masterpiece combined perfectly with melodic harmony. Although you might buy it for their more popular upbeat songs "The Middle" and "Sweetness", this whole cd is a gem. Jimmy Eat World sings with heartfelt lyrics and plays music to enhance the experience. Originally titled Bleed American, which is also the first track on the album, it leaves you with a feeling that can't be named. There are very few albums that keep my attention all the way through. I love "Your House" "If You Don't, Don't", "Cautioners", and "Hear You Me" But my favorite song on this album is the last track called "My Sundown", what a beautiful work of music. It has more than paid for itself. I love these guys and they are awesome in concert. This JEW's (Jimmy Eat World) breakthrough CD. "The Middle" was an insanely popular song and it's easy to see why. It very catchy, but meaningful at the same time. And the rest of the CD is amazing as well. There are several softer rock songs, but you can really see the tenderness in each of these songs. Also, the singer's voice has matured since "Clarity" (their previous album), so that is a good thing. JEW distinguishes themselves from punk/emo and has vaulted themselves into greatness with this CD. Buy it! 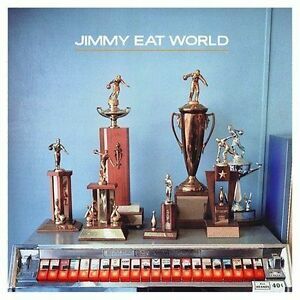 I received my Jimmy Eat World CD today in the the mail at work. I gotta tell you this CD brought back some wonderful memories. I forgot how much I loved the whole CD. It was also in excellent condition. No scratches and it was in its original case.I couldn't wait to get off and listen to it, so I listen to it on my lunch break. Truely one of my favorit CDs!!!!! There were 2 or 3 songs on this album I wanted to download, found a like-new CD on half.com for a little more than the cost of downloading a few songs. Now I have the whole disc, and I like just about every song on it. Overall a great album. I've increased my library and exposed myself to music that I would not have heard otherwise. A great buy!